CHARLESTON, S.C. – Couples get engaged at the ballpark all too frequently, but Brady Martinez managed to put a unique spin on his proposal. Martinez’s girlfriend Josie Hancock threw out the ceremonial first pitch before Charleston’s game against Augusta. Martinez served as her catcher, then walked to the mound to give her the ball. Martinez presented the ring and Hancock, his girlfriend of 18 months, accepted. The couple will be married in a little more than a year (in a church, not a ballpark). 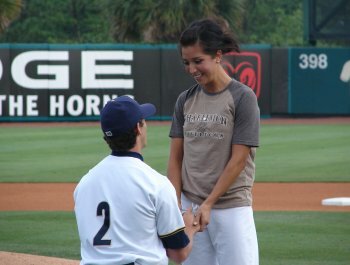 The unusual proposal may have surprised Hancock, but Martinez’s RiverDogs teammates were anxiously watching to see what he would do. The 25-year-old pitcher told teammates two weeks prior he wanted to do something unusual and asked them for advice. Dunn was scheduled to be in the stands video taping hitters and pitchers that day. He entered the stands early to make sure he recorded the big event. Martinez had plenty of reason to celebrate the victory, too. Unlike the thousands of fans who’ve proposed via stadium announcements, scoreboards on other ballpark props, Martinez still had work to do after Hancock accepted his proposal. He took the mound and threw a scoreless eighth inning. He returned to try and close the game in the ninth, but was removed after walking the first two batters.